Myofascial Trigger Point Therapy for neck, shoulder, back, hip, knee pain. Sports injury and pain management clinic Pain Physicians NY (Brooklyn & NYC) provides a full range of Pain Relief procedures and advanced pain management services including electrical nerve stimulation for chronic pain among latest cutting edge procedures: Body Composition Analysis, High Tech Shockwave Therapy, groundbreaking Interstitial Laser Therapy and Stem Cell Therapy. Our Brooklyn chiropractors are among the best in the region. The muscles in the human body are surprisingly interconnected, and they also make about 36% – 42% of our body weight for the average adult. The function of muscles is to enable movement as they contract or relax, in order to make the bone movement possible. Various factors can cause the muscles to become rigid and inflexible. Consequently, moving these muscles becomes painful, making action associated with that particular muscle difficult. This type of pain is referred to as myofascial pain. The most common symptom is pain originating from the muscle and the surrounding soft tissue. It can be differentiated from other kinds of pain because it usually presents with a specific trigger or tender point. Touching or pressing on these points can cause a sharp pain and so does physical activity. The trigger point can be identified as a knot or small bulge along the muscle that is tender to the touch. 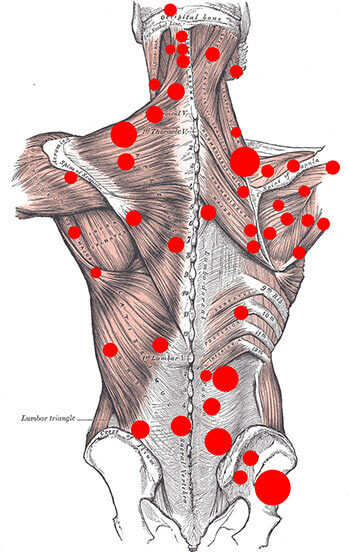 Besides the actual trigger point, other surrounding muscle can be affected. For example, a knot at the top of the shoulder may be noted, but pain can be triggered by pressing any region up the side of the neck. Such a trigger point can also cause pain to other regions including a headache, referred to as a tension headache. Sufferers of myofascial pain also complain of depression, fatigue, and behavioral disturbances. There is still no consensus among medics about what a trigger point actually is, but the diagnosis of myofascial pain is done through an analysis of symptoms, pain patterns and palpation (feeling for the knot). It usually presents as a hard nodule under the skin and a touch can cause it to twitch while pressing causes pain. There is also a higher degree of temperature at the trigger point that can be noted through touch. Treatment of the condition involves identifying the problem area and then either reduce the pain caused using anesthesia or deactivating the trigger points using therapy. Medications – pain relief injection can be performed directly onto the muscle knot, which is often done without anesthesia, hence the name dry needling. It involves the use of local anesthesia, pain killers, and steroids to reduce the pain caused. However, this type of treatment is not advisable when the area is close to a major organ like the kidney. Treating each trigger point is relatively simple, while treating the whole myofascial pain syndrome can be a more complicated process. The technique consists in applying pressure with a finger or other instruments at the trigger point and increasing the pressure applied as the trigger point releases and softens. There are various available techniques for such a treatment. This kind of therapy is the safest method to getting rid of myofascial pain and can be used in any region of the body. Many patients experience a relief of pain during the first treatment, while others may require a couple of treatments before the pain starts to diminish. Soreness is common after the treatment for a day or two. Good communication with your therapist as well as staying positive during the entire treatment is important. Don’t expect miracles. Myofascial trigger point therapy is just another treatment method among many others that tends to relieve your pain as much as possible. Pain Physicians NY (Brooklyn & NYC) provides a full range of advanced pain management services to help our patients return to a healthy and pain-free lifestyle. Our approach to pain care is individualized, and we providing the most effective treatments and utilizing the latest technologies available in USA. The pace at which technology is growing can make last year’s methods obsolete. Our team is always at the top of their game and at the head of the pack.